2015-12-06 ~ National Association of Postal Employees, Tirunelveli Division. Charter of Demands - JCM (NC) Staff Side. The open session meeting of joint circle conference of NUR III and NUR IV was held at Sri Padam Residency, Tirumala bye pass road, Tirupathi on 10.12.2015 under the Charimanship of Sri Narasimhulu. Sri S S Reddy Circle Secretary NUR IV were addressed the open session. Our Secretary General, explained the latest developments about 7th CPC, Cadre restructuring issue, RMS/Postal sectional problems and other issues. நெல்லை கோட்டத்தில் 72 வது அலுவலகமாக களக்காடு அஞ்சலகம் ஒருங்கமைவு வங்கி சேவையில் (Core Banking Solution) இன்று 11.12.2015 இணைந்துள்ளது. இன்று காலை நடைபெற்ற விழாவிற்கு நமது முதுநிலை கண்காணிப்பாளர் திரு V.P. சந்திரசேகர் அவர்கள் தலைமை தாங்கினார். களக்காடு நகர தலைவர் திரு P.C. ராஜன் அவர்கள் குத்துவிளக்கு ஏற்றி தொடங்கி வைத்தார். இந்நிகழ்ச்சியில் பாளை PRI (P ) திரு குருசாமி, Deputy System Managers திரு.இரசூல்முகைதீன் திரு.R.மனோகரன் ஆகியோர் கலந்து கொண்டனர். நமது கோட்ட தலைவரும் களக்காடு அஞ்சலக அதிகாரியுமான திரு.S.A. இராம சுப்பிரமணியன் அவர்கள் நன்றி கூறினார். இந்நிகழ்ச்சியை களக்காடு அஞ்சலக தோழர்கள் சிறப்பாக ஏற்பாடு செய்திருந்தனர். It was clarified by Postal Directorate that hence forth, the Departmental Examinations will be conducted online and new calendar of Examinations will be issued after the engagement of new agency for conducting the exams online. Historical Judgement on MACP for promotes. The CAT Principle Bench delivered Judgement on MACP for promotees in OA NO 3756/2011 on 3-11-2015 in the case of Shakkel Ahmed Burney. To Download Judgement Click here. முதற்கட்டமாக வெள்ளநிவாரண பொருட்கள் 09.12.2015 அன்று பாளையம்கோட்டை HO வில் இருந்து அனுப்பிவைக்கப்பட்டது .இந்த நிகழ்வில் நமது முதுநிலை கண்காணிப்பாளர் திரு .VP .சந்திரசேகர் அவர்கள் தலைமை வகித்தார் .ASP (HQ) திருA .சொர்ணம் .ASP (OD) திரு M .வீரபத்திரன் ,Palayankottai Postmaster N .கண்ணன், பாளை PRI (P ) K.G. குருசாமி திருநெல்வேலி PRI (P) S .கனகசபாபதி NFPE செயலாளர் ஜேக்கப்ராஜ் உள்ளிட்ட அலுவலக ஊழியர்கள் பங்கேற்றனர் . இந்த உதவியில் பல்வேறு தோழர்கள் பங்களிப்பை அளித்தனர் . அதுபோல முக்கூடல் அஞ்சலகம் சார்பாக வரவு வந்த ரூபாய் --1100 கும் போர்வைகள் வாங்கி கொடுக்கப்பட்டது. முக்கூடல் அலுவலகத்தில் நமது செயலாளர் S.சூரியகலா SPM அவர்கள் எடுத்த முன் முயற்சியால் இந்த பணம் திரட்ட பட்டு பாளையங்கோட்டை தலைமை அஞ்சலக அதிகாரி வசம் ஒப்படைக்கப்பட்டது . Today SGFNPO along with GS NAPE-C meet Member (P),Member (Tech),DDG(vig)& DR MV. 1) PA/SA cadre restructuring is under consideration of DOP&T . Department of Personal called some information from the Department of Posts in turn Directorate send all the details sought by DOP&T 2days before. 2) MMS cadre restructuring proposal divided as two parts. 2. Approval required from Postal board both are under processing. 3. Flood advance for Tamilnadu&Puduchery : Instructions has been issued to CPMG Tamilnadu Circle to grant Flood advance to the affected staff of Tamilnadu&Puduchery. 4. CBS GO LIVE: Member (Tech) assured that instruction will be issued to Tamilnadu Circle that CBS go live will be stopped for time being in flood affected areas. Ref: - Your No. 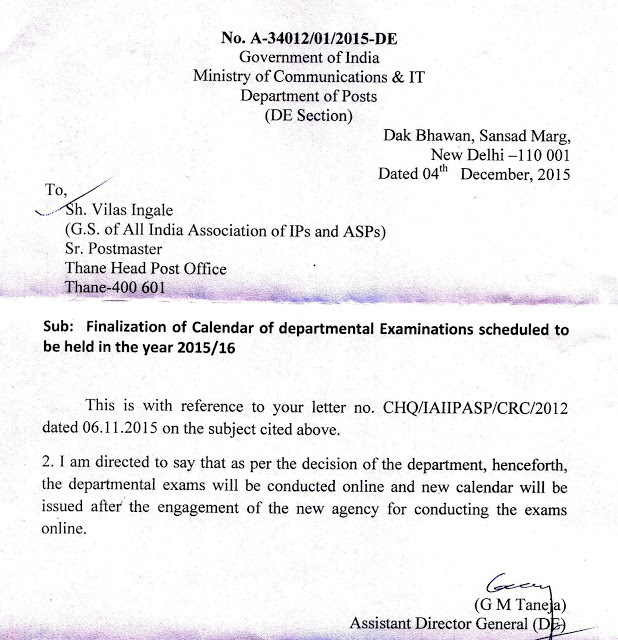 7-1/2015-PCC dated 26.11.2015. With reference to your letter No. cited above, we are submitting a note requesting modifications in the recommendations of the 7th CPC regarding the demands placed by the staff Side (NFPE & FNPO) in the Joint Memorandum submitted to the Chairman 7th CPC. A copy of the Joint memorandum submitted by NFPE & FNPO is enclosed herewith for your ready reference. It is requested that the Department may suggest the empowered committee headed by cabinet Secretary, to accept the modification suggested by us. Regarding the issues which are common to all Central Government Employees, the JCM National Council, Staff Side, will be submitting a detailed letter to Government seeking modifications. As we are part of the JCM National Council Staff Side, we fully endorse the view points of the JCM (NC) staff side on issues which are common to all Central Government employees including Postal. Modification sought for: - As the department is implementing the IT Modernisation project including Core Banking Solution and Core Insurance Solution, the nature of work of PA/SA cadre has become highly complicated and high-tech. In addition there are other duties performed by PA/SA cadre which we have elaborately explained in Chapter VI and VII of our memorandum. As there is enough justification for upgradation of Grade pay of PA/SA from 2400 to 4200, we demand the Department to take up the case with Government to grant the enhanced pay scale, modifying the recommendations of the Pay Commission. News on meeting of JCM & NJCM(Staff Side) on 7th CPC. Today Departmental council meeting was held under the Chair of Secretary (P). 7th CPC related issues are discussed. Both Federations submitted joint Memorandum. The meeting discussed all the matters cadre wise. Secretary responded favorably for our demand. Let us hope for the best. Click here to see the Joint letter. Meeting with Postal Board on Pay Commission ended with positive note. Details will follow. அதிகாரிகள் மற்றும் ஆட்சியாளர்கள் பேசுறதெல்லாம் நல்லாத்தான் இருக்குதையா ! திரு .தீர்த்தாரப்பன் ASPOs (OS) தூத்துக்குடி அவர்கள் Madurai, Regional Office க்கு மாற்றப்பட்டுள்ளார் . அது போல திரு .N.M.குமரன் ASPOs அவர்கள் Regional Office, Madurai லிருந்து பாளையங்கோட்டை உபகோட்ட கண்காணிப்பாளராக மாற்றப்பட்டுள்ளார் . Postal dept has also floated tender for appointing consultants for the new venture; likely to finalize one by next month. As many as 25 commercial banks and institutions including Deutsche Bank, State Bank of India, Punjab National Bank, Axis Bank, Yes Bank and IDBI have evinced interest in partnership with India Post for their payments bank venture. The postal department has also floated tender for appointing consultants for the new venture and likely to finalise the consultant by next month, a senior official from the department of posts told Business Standard. "We are in the process of appointing a consultant. Subsequently, we will take a decision on the various proposals by banks and institutions which might take few months. We are evaluating the proposals," the official said. In August this year, RBI approved Payments Bank plans of 11 firms including Paytm, Reliance Industries, Bharti Airtel, Departments of Posts (DoP), Vodafone and others. The official said such partnerships could be beneficial for end users and could enable offerings of mutual funds, insurances and other related products to the customers. As per RBI guidelines, the first branch of payments bank has to be set up within 18 months. Payments bank will be able to offer products such as demand deposits and remittances. They will not be allowed to undertake lending activities and will initially be restricted to hold a maximum balance of Rs 1 lakh per customer. However, they will be allowed to issue ATM or debit cards as other prepaid payment instruments, but not credit cards. Money remittance is a big segment and 55-60 per cent of these happen in the un organised sector while the total market is estimated to be Rs 2 lakh-crore, half of which is in the informal sector. DoP is in the process of preparing a note for approval by the Public Investment Board (PIB) for an investment of around Rs 300-400 crore for Payments Bank. Under the payments bank, the initial plan is to have 650 main branches where the department has head or bigger post offices. Subsequently, 25,000 'spoke' branches will be set up while the other 130,000 POs will act as business correspondents. The new unit will use the existing infrastructure of the postal department and will pay user charges to the department. According to an earlier detailed project report by Ernst & Young for DoP, the payments bank will be able to break-even in five years, once operations start. And, DoP will earn revenue of Rs 250 crore in the first year from the new banking entity, expected to go up to Rs 600-700 crore annually in the five years. 1.Extension of tenure: In all nationalized banks where they deal with full and full money transaction there was no tenure in clerical cadre in the beginning. Now a day they are not transferred up to ten years. Therefore in our department also the tenure for clerical cadre should be raised to 10 years. We are the second large departmental establishment in our country and hence if the tenure is extended to 10 years there will be huge savings to the department and the government also. 3. Commutation: official retired on 31.12.2015 will get commutation in the old pension. But official retiring on 01.01.2015 will get commutation in the revised pension. But many such pensioner got commutation in the revised pension by approaching the court. Hence our demand is to get commutation in the revised pension. 4. Notional increment: official retiring on 30th June every year will retire without having the benefit of getting increment even after they worked for full year. The state government of tamilnadu has issued orders for fixing the notional increment for calculation of pension those who retire prior to the date of increment. Our union should also fight for the same. (Android based) App is a user-friendly mobile application which enables to collect the report geo-tagged information on various parameters such as type of Post Office, Name, Services offered, Delivery Status, PIN-Code and Address. This Mobile App will provide a platform for controlled crowd sourcing to build spatial database on Bhuban Geo-Platform. The internet connectivity is not required during data collection process. The internet connection or Wi-Fi is useful and necessary to upload the data collected by the user which can be done on the spot if connected or the same can be uploaded later to the BHUVANIndiaPost server when the user gets internet connectivity. To view a step by step procedure for operational convenience of the users please Click Here. 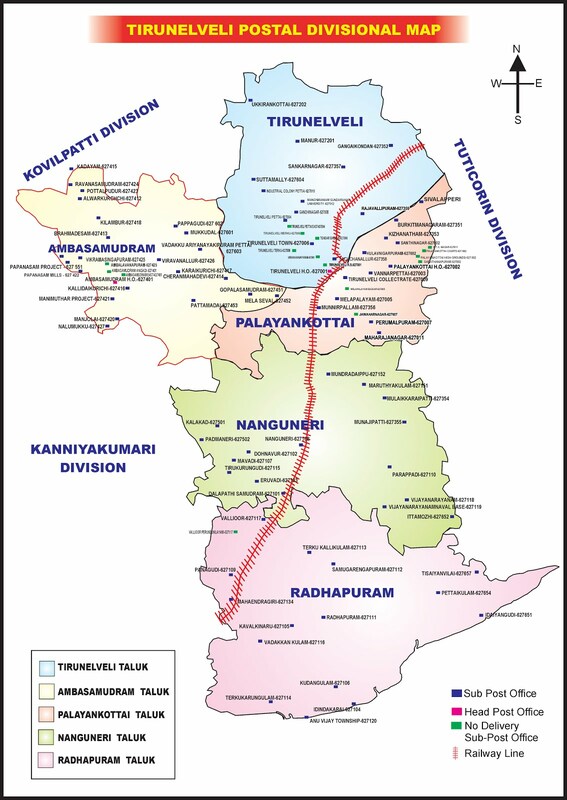 Views of NAPE,Gr C on 7th CPC Submitted to Directorate. The 7th pay commission have now given its recommendation detailing the modus opearndi as to how the same was arrived at ., The general dictum claimed to have been adapted are not uniformly applied in all cases and only some isolated cases have been benefitted that too on extraneous reasons like court observations and parity among recuritees from the one and the same examination regardless of nature of the work and department to which they are appointed . The job evaluation has been totally treated as an non entity and the evidence tendered by the stake holders are meted with luke- warm response. The observation of V and VI pay commission have been bluntly cited to ignore the up gradation sought for and thereby failed to contemplate the justification under lying the existing work pattern and schedules in the changed scenario. While the past pay commissions relied justifiably on fair comparison among the work of homogenous nature , the 7 th pay commission had decided to ward off such approach on the plea that historical parity is longer a moot point under its consideration for the present. Most of the up gradation sought for under this agenda has been turned down by the 7th commissions on this reason ( right from pay of Postal Board members to that of Postal asst.) ; Likewise equal pay for equal work is also prime victim of this pay commission ( eg. Artisan in MMS ). 7 வது ஊதிய குழு வரமா சாபமா ? The Shocking fact of Pay hike recommended by 7th Pay Commission. Pay commission said 14.29 % Hike in Pay is recommended, Media said central government employees will get 23.55% hike in salary including allowances. we will find out the real fact about the so called Bonanza..! Let us know whether the Media claims are true or not through a simple calculation…! The strength of Group C employees in Central Government is 85%. So we must know what the Pay Hike is recommended for them actually. It doesnt make sense that the Pay hike recommended for remaining 15 % taken into account. Because they are creamy layer of the Government. The Pay Hike for them also will be decided by them. So the take extra care for not giving more to this 85%. His Net Pay for the month of January 2016 in Sixth CPC is given below.. He will be drawing Rs.320 lesser in 7th Pay Commission revised Pay than from his Sixth CPC pay. Anybody can calculate from the above example that how much percentage of increase this Group ‘C’ Government servants get from this 7th CPC bonanza ? ஆக மொத்தத்தில் ஒவ்வொரு ஊழியருக்கும் சம்பளம் குறையவே செய்யும். என்னே விந்தை ? எதற்கு இந்த ஊதிய குழு ? Meeting of JCM & NJCM(Staff Side) on 7th CPC tomorrow. Meeting with Staff Side Representatives of Departmental Council (JCM) to discuss issues relating to recommendations of the Seventh Pay Commission. No. 06/04/2015-SR Dated 2nd December, 2015. Subject: Notice for Meeting with Staff Side Representatives of Departmental Council (JCM) to discuss issues relating to recommendations of the Seventh Pay Commission. A meeting with the Departmental Council (JCM) Staff Side representatives will be held on 08-12-2015 at 11.00 A.M. under the Chairpersonship of Secretary (Posts) in G.P. Roy committee Room, 2ndFloor, Dak Bhavan, New Delhi to discuss the recommendations of the Seventh Central Pay Commission relating to various cadres/posts of the Department. The Staff Side may examine the recommendations relating to the different cadres and furnish their comments.